and keep forgetting to photograph them and jot down the recipe. Silly me! Being realistic, I've made it a goal moving forward to publish two new recipes each week, and send out a newsletter every other week. If you haven't subscribed yet, I would love for you to submit your email to the left of this post. I made a version of these pumpkin fries last week when I tested a few different veggie burgers, and remembered today that I still had half of a pumpkin left in my fridge. Yay! Last week, I roasted them with thyme, but today all I had on hand was sage. I'm so happy I ran out of thyme, because these are about 5 times better than my first version. 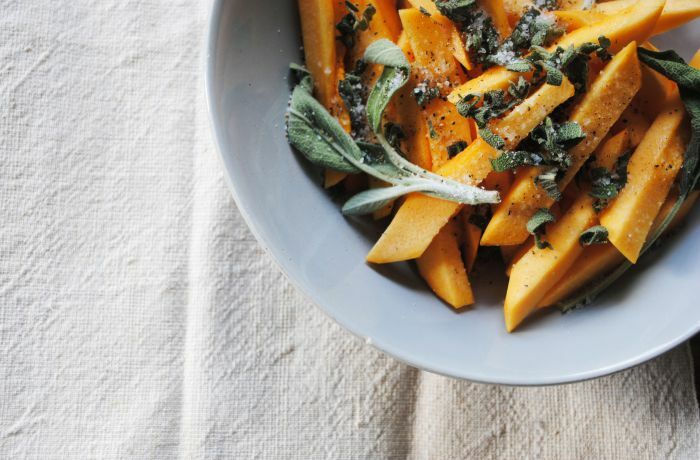 The sage leaves get crispy and slightly charred, which gives the pumpkin a deep smoky flavor. If you don't have pumpkin, you can easily substitute butternut squash or sweet potatoes in this recipe. There may be a slight textural difference, but all have very similar flavor profiles. 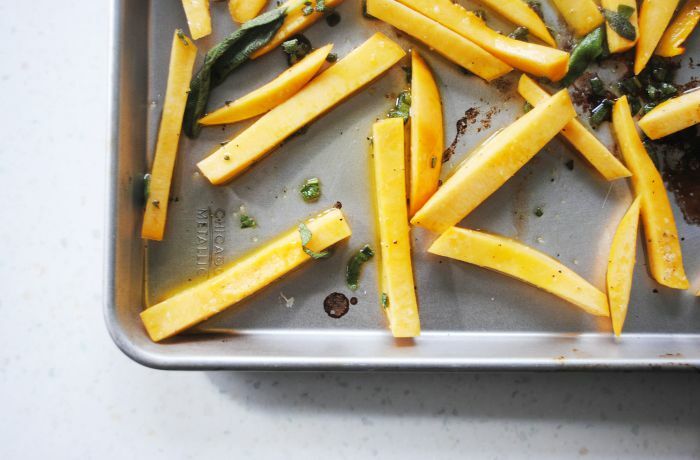 The most important thing to note about this recipe is that even though we're baking the fries in the oven, we are baking them at a very high temperature. Unrefined oils are packed with vitamins and minerals, but we want to avoid using them at all costs in an oven with heat this high because they typically have low smoke points. If you heat an oil past it's smoke point the fats start to break down and release free radicals. Free radicals can do serious damage on a cellular level, so definitely opt for oils with a smoke point above 425 degrees. If you don't know them off the top of your head, you can easily do a google search to find out more info. 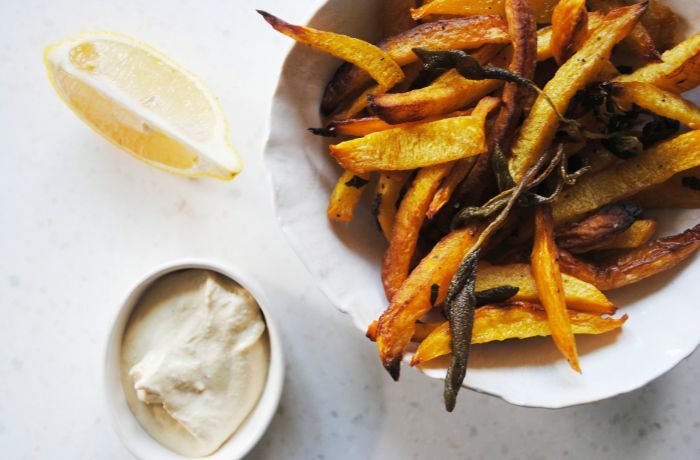 I ate my fries with a quick lemon-tahini dip (literally tahini, lemon, water and garlic blended) but I imagine these would also pair well with ketchup, cashew cheese or hummus. Sage is an herb native to the Mediterannean, and is popularly known by herbalists for its memory-enhancing properties. Sage also contains a number of antioxidants and has anti-inflammatory benefits. Pumpkin is a great substitute for traditional white potatoes, because it contains a high amount of carotenoids which have been proven to reduce the risk of certain diseases, particularly cancer and eye disease. Pumpkin (along with other winter squash, sweet potatoes and carrots) also contains Vitamins A (vision support) + C (boosts your immune system), potassium and magnesium. *Note: This is a delicious recipe, but it does contain a fair amount of oil. If you're trying to avoid fat or plan on eating most of these by yourself (like me) you can always cut the oil in half or omit entirely. I'm not positive since I did use oil in my own version, but they probably just won't turn out as crispy. Preheat oven to 425 degrees F and place a baking tray on the bottom rack. 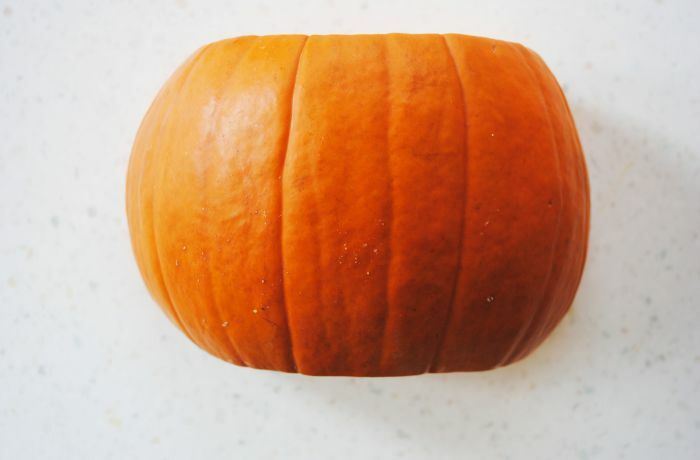 Slice off the top of your pumpkin, cut in half and de-seed inside by scraping with a large spoon. Using a potato peeler, remove the fibrous outer layer of skin. Cutting one half at a time, place pumpkin inside-down (use photo above as an example) and cut into strips roughly 1/2 an inch thick. Most strips can then be cut in half again to make 2 fries, with a little trimming here and there. Not all pumpkins are the same size, so use your judgement. Place fries in a large bowl. 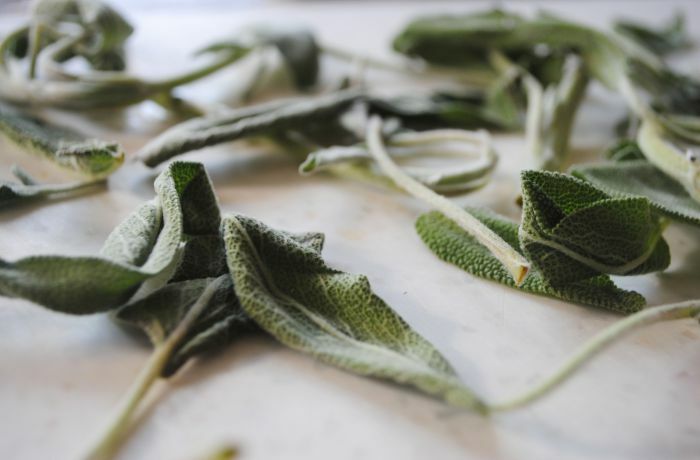 Roughly chop 15 sage leaves and add to bowl, along with 2 full sage stems with leaves on. Next add salt, pepper and olive oil. Toss to coat. Transfer to hot baking tray and transfer to oven. Cook for 35-40 minutes, flipping every 15 minutes or so. Once browned and crispy, remove from oven and serve with dipping sauce of choice.